Replacement handset cord for Norstar phones. Buy a few for spares or as an immediate replacement. Three colors are available for two different lengths of handset cords. Why pay more for a basic six foot cord when we offer twelve foot cords at wholesale prices in Black, Ash/Beige and Grey. 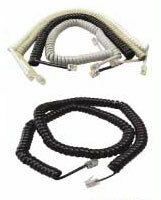 We also offer extended length twenty-five foot cords in the same three colors - Black, Ash/Beige and Grey. Other Phone Cords for your telecom requirements.